Smart-Shield’s Exhaust Wraps especially developed for the headers and exhaust where protection against heat is necessary. These wraps are either made from Ceramic, Fiberglass or Silica Fibers (depending on the temperature) and reduces radiant exhaust heat, keeping the incoming air/fuel mixture cool and potent. These fiber materials can be used in different applications under temperatures up to 1300°C and have excellent chemical stability and strong resistance to thermal shock and corrosion attack. Our Exhaust Wrap reduces under-hood temp. up to 70%, increases horsepower and fuel efficiency. Wrap works by holding heat within the header, which creates a better exhaust flow. This allows easy removal of spent gasses and creates more airflow to the engine. Exhaust Insulating Wrap withstands continuous heat up to 2000°F, and contains no asbestos. 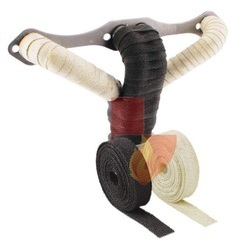 Looking for Exhaust Wraps ?